2) The drought that has plagued California for five years is not nearly over. California’s lack of storage capacity has begun to be addressed. When Californians passed the Prop 1 water bond two years ago, the voters who have not been in a spending mood lately, acknowledged that we need to invest in order to better manage our water. New Assembly Speaker Anthony Rendon rose to public prominence in California through his work on the water bond, which he and others presented to the state. 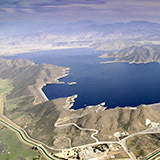 The proposition authorized $7.12 billion in general obligation bonds for state water supply infrastructure projects, such as public water system improvements, surface and groundwater storage, drinking water protection, water recycling and advanced water treatment technology, water supply management and conveyance, wastewater treatment, drought relief, emergency water supplies, and ecosystem and watershed protection and restoration. Rendon, who sat down with California Forward for a video interview recently, said the storage issue is vital to increasing supply and key to other water efforts in California. The California Economic Summit has identified water as a key issue in the state’s economic future. The Summit’s One Million Challenges includes making available one million more acre-feet of water each year. You can read about ideas of how to reach that goal, plus how to add one million more middle-skill workers and one million more housing units in the 2016 Roadmap to a Shared Prosperity. With Californians using substantially more water each year than the state’s infrastructure can reliably supply, the Summit will support the expansion of watershed management solutions that can help regions conserve, capture, and re-use enough water to achieve a sustainable water balance.